Explanation: Marked by an unusually bright central region, swirling dust lanes, and far flung tidal tails, peculiar NGC 3256 is the aftermath of a truly cosmic collision. The 500 million year old clash of two separate galaxies spans some 100 thousand light-years in this sharp Hubble view. Of course when two galaxies collide, individual stars rarely do. Giant galactic clouds of molecular gas and dust do interact though, and produce spectacular bursts of star formation. In this galaxy clash, the two original spiral galaxies had similar masses. Their disks are no longer distinct and the two galactic nuclei are hidden by obscuring dust. On the timescale of a few hundred million years the nuclei will likely also merge as NGC 3256 becomes a single large elliptical galaxy. NGC 3256 itself is nearly 100 million light-years distant toward the southern sailing constellation Vela. The frame includes many even more distant background galaxies and spiky foreground stars. "Of course when two galaxies collide, individual stars rarely do"
why? if they're moving closer to each other, why does their gravitational pull not make this more likely? 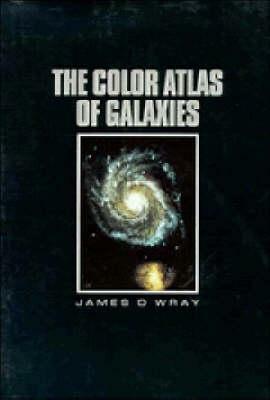 The book on astronomy that has taught me the most is James D Wray's The Color Atlas of Galaxies. The book contains 94 shiny pages of small, blurry pictures of galaxies with wonderful, "overall" UBV color information on their large-scale stellar populations. I can't tell you how much I have understood about the colors and the populations of galaxies by studying the pictures in that book! M81 (center right), M82 (center left) and NGC 3077 (bottom right). NGC 3077 with central starburst. Photo: Hubble. Anyway. There are a few galaxies in that book that stand out because of their colors. Two - yes, that's all I can think of now, two - stand out because they have mostly yellow disks and blue centers. One of them is NGC 3077. Well, NGC 3077 is the third member of the M81/M82/NGC 3077 tango for three galaxy group. This picture from SEDS Messier Database gives you a good idea of how the three members are interacting. NGC 3077 looks boring in most pictures, like a yellow blob. But James D Wray revealed its central blue starburst, and the Hubble telescope confirmed it. Central starburst of NGC 3256.
starbursts of NGC 3256 and NGC 3310. I recommend this page, where you can see hydrogen gas being driven out of NGC 3256 by the sheer force of the merger that this galaxy has undergone. 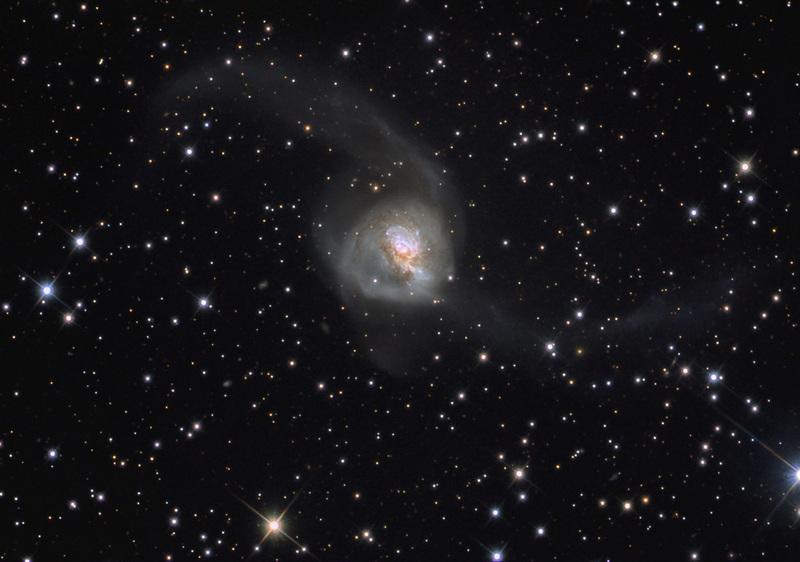 You can actually see those two enormous jets being flung out of the galaxy in the picture by Rainer Sparenberg, Stefan Binnewies, and Volker Robering from Capella Observatory. But to return to James D Wray's book, the blurry image of the bluish and dust-reddened center of NGC 3256 in that book looked extremely tantalizing, and I have wanted to see a good picture of it ever since. So I'm very happy about today's APOD, although I think that in some respects the Sparenberg, Binneweis and Robering portrait of this starbursting galaxy is just as good as Hubble's. It's because the stars are really, really, really far apart. Our human minds simply can't even begin to picture how far apart they are. And really, really, really small in comparison to the distance between them. <<NGC 3256 is the most luminous galaxy in the infrared spectrum located within z 0.01 from Earth. NGC 3256 has double nuclei: the northern and southern nucleus, separated by 5", which at the distance of NGC 3256 corresponds to 850 pc. The nuclei are clearly visible in radiowaves and mid infrared, but the southern nucleus is hidden by dust lanes at the optical spectrum. The two nuclei will coalesce as the merger proceeds to its final stage. Lipari et al. note the presence of a third nucleus based on the presence of an obscured knot detected only at wavelengths λ ≥ 3.75 μm, which they suggest that it is a nuclear HII region. There are evidence of an outflow of ionised gas from the northern nucleus with shocks which is attributed to a superwind powered by the starburst. Based on observations by Spitzer Space Telescope, and Chandra X-ray Observatory, Ohyana et al. suggested that the southern nucleus of NGC 3256 is a heavily absorbed low luminosity active galactic nucleus, with X-ray spectrum consistent with a typical Compton-thin Seyfert 2 galaxy. NGC 3256 features two tidal tails. The two tails account for approximately the 75% of the HI emission of the galaxy, which, however, includes a central absorption feature. Michael Rubrock et al. found that the two tails have different colors, suggesting different stellar populations. The eastern tail has mean stellar population age determined to be 841+125−157 Myr and larger percentage of mass belonging to the stellar population that was formed before the galaxy interaction. In the eastern tail were also detected several young (< 10 Myr), low mass objects with strong nebular emission, indicating a small, recent burst of star formation. The mean stellar population of the western tail was estimated to be 288+11−54 Myr and its light is dominated by stars formed after the interaction. The tails feature large number of star clusters, especially the western tail.